Did you know that replacing old windows and doors with more efficient options is one way to significantly reduce your utility costs? According to the U.S. Environmental Protection Agency (EPA), being energy-efficient in your home can save you about a third on energy bills. In addition to lowering heating and cooling costs, replacing your outdated and inefficient windows and doors will improve your overall comfort and reduce fading of carpets, artwork, and other items from the exposure to sunlight. Or, alternatively, if you have a tighter budget, you can improve your existing windows and doors with some of our energy-efficient recommendations. If your home is older or your windows are inefficient, it might be more cost-effective to replace them all together. 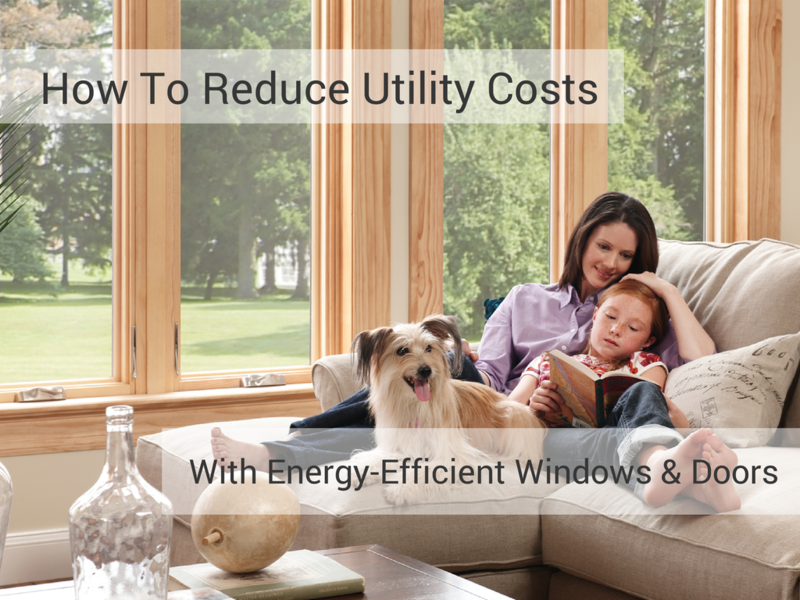 When properly selected and installed, energy-efficient windows eventually pay for themselves through lower heating and cooling costs, and sometimes even lighting costs. Before selecting new windows for your home, it is important to understand the energy performance ratings of windows. The Department of Energy (DOE) and the Environmental Protection Agency (EPA) have developed the ENERGY STAR designation for products meeting certain energy performance criteria. 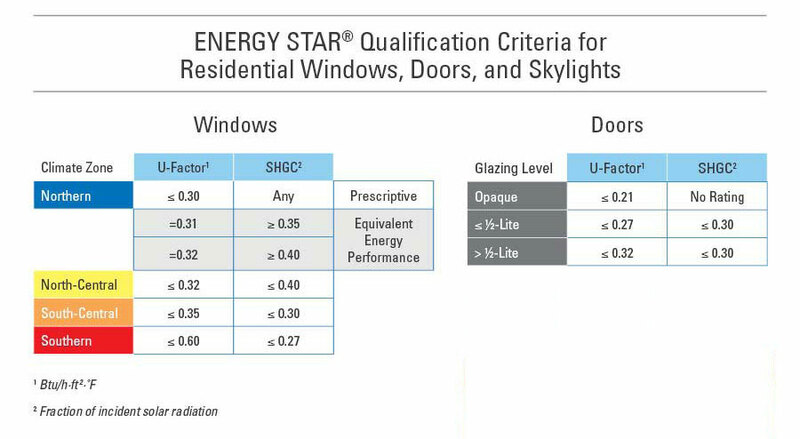 Use this guide provided by ENERGY STAR to determine which energy performance ratings you need for your windows based on your climate and the home’s design. PRO: Acts as a good insulator and easy to maintain. CON: Is a rapid conductor of heat, making it much less energy efficient than the other materials listed. Gas Fills – this is the gas (typically argon or krypton) that is “sandwiched” between glazing layers to improve insulation and slow heat transfer. Glazing – the glass used in the window. Glazing coatings can substantially affect a window’s U-factor, or degree of insulation against the environmental factors. Keep in mind that the number of layers of glazing (single, double, or triple) doesn’t necessarily equal greater efficiency. Low-E – stands for low emissivity, or the window’s ability to reflect heat. Low-E coatings add up to 10% to the price of a window. Alternatively, if your windows are in fairly good shape, you can apply Low-E films to your windows. They’re effective, but not as much as those put between glazing layers during manufacturing. Spacers – are separated sheets of glass within the window. They are used to improve insulation quality by preventing condensation and heat loss. Caulking and weather stripping – to reduce air leakage around windows. Use caulk for stationary cracks, gaps, or joints less than one-quarter-inch wide, and weather stripping for building components that move, such as doors and operable windows. Adding storm windows –field studies have found that they can help reduce air movement into and out of existing windows. Therefore, they help reduce heating and cooling costs. Using window treatments or coverings – can reduce heat loss in the winter and heat gain in the summer. Most window treatments, however, aren’t effective at reducing air leakage or infiltration. As an ENERGY STAR partner with EPA certification, Frontline Windows & More, Inc. windows and doors are compliant with ENERGY STAR criteria. If you have any additional questions about reducing your utility costs by switching to energy-efficient windows or need assistance choosing the right replacement windows for your home, please contact us. Copyright © 2013 Frontline Windows & More Inc. All Rights Reserved.